Leadership is all about guiding a set of individuals towards achieving a predefined objective of Business Organisation. The success of a leader largely depends on the performance of its followers (Davis, 2011). Here in this Business Organisation, I have to choose a competent and successful leader who proves his/her leadership capability by delivering significant contributions towards his/her Business Organisation. I need to provide logical reasons behind choosing that particular leader. In this assignment, I will try to render a detailed description on the background, experiences, strengths, leadership styles, leadership skills, roles and responsibilities of the leader. I will also try to evaluate his/her approach towards handling demanding situations that arise in his/her Business Organisation. For this assignment, I decided to fix my focus on Mr. Ralph Luchow, who uses to be at the leadership position of Hills Adventist College. In order to gather necessary information from him, I needed to conduct an interview session with him. The information that I gather proves to be highly beneficial for my assignment. It is necessary to mention at this stage that why I have chosen Mr. Ralph Luchow, as the one from whose responses to my interview questions I can construct my assignment on leadership. The first and the most important reason behind choosing Mr. Ralph lies in the fact that he successfully leads the college to achieve its present status. He plays the role of an ideal leader to lead his entire workforce in such a way that they can provide excellent service to the students as well as to the community. Mr. Ralph, the Principal of the school, pays acute attention to student’s and parent’s grievances and handles their grievances with effective solution. He is able to maintain a healthy institutional atmosphere. Little students find their school to be the perfect one. Under his successful leadership, the college is able to formulate the most suitable study pattern for its students. The educators, who are teaching the students of the college for many years, gladly accept his leadership. Under his leadership, they work with absolute sincerity. A leader must possess an effective listening skill (Lord and Hall, 2009). Likewise, Mr. Ralph wholeheartedly hears the suggestions and objections of the educators and is able to find a speedy resolution to their objections. He is able to maintain a healthy team spirit among his subordinates. He is a man who stands for efficiency, honesty and diligence. He is successful in lifting himself as the role model for his subordinates. He never pretends to be busy. He gives me ample time; so that I can conduct my interview session with him in a proper way. He is so communicative that I never face any trouble interviewing him. He pays heed to my questions and answers properly so that I can complete my assignment with ease. Due to all the above-said reasons, I have decided to base my assignment on Mr. Ralph Luchow. Mr. Ralph has a strong ambition of becoming an educator since his childhood. Before joining Hill Adventist College, he worked as an educator for as many as 22 years. With a vision of becoming an educator, he decided to go for a teacher education degree (Bachelor of Education), only after getting a Bachelor of Arts degree with a specialisation in English. It is also essential to mention that Mr. Ralph has completed his junior and senior level schooling from Matthew Pearce Public School, a school of repute at his time. There he had an educator named Mr. Matthew Griffith, who had immensely influenced Mr. Ralph and by following his footmarks Mr. Ralph developed a strong intention of becoming an educator in his future life. As it is already mentioned that he has worked as an educator for as many as 22 years. He started his teaching career at Maroota Public School. After spending ten years educating the students of the school, he moved on to the Delany College, where he became the room leader. After showing an effulgence of leadership skills in the room leader position of the college for as many as five years, he decided to join Gilroy College, where he became the vice principal. He successfully performed his responsibility in the college for more than four years and finally came to the Hill Advent College. He took the charge of the Principal of the College two years back and performed his responsibility with excellence since then. By interviewing the person in a through manner, I have discovered that he possess certain strengths of characters that help him to become a successful leader. He has patience. He has sound knowledge of the administration of the college. He has an analytical mind with the help of which he can control any adverse situation. On asking about his interests, he replies that he prefers to build up friendly relationship with his students and even with his colleagues. The educators of the college, especially the younger ones, get ample assistance from him. Studies of management propagate various leadership styles among which autocratic leadership and democratic leadership are mentionable (Fairholm, 2009). Autocratic leadership brings to the fore the idea that a leader has to take organisational decisions without even consulting with his/her team members and the team members has the responsibility to follow the directives of the leader without even questioning their validity (Allen, 2009). Democratic leadership, on the other hand, proposes that a leader must include his/her team members in the organisational decision-making process and a collective decision should be made with which each and every one of the Business Organisation will be agreed with. This style of leadership is a much more liberal one compared to the former one. This leadership makes successful use of the individual creativity of the team members and provide increased level of job satisfaction for them. Another stratum of management studies bring to the fore two new leadership styles. One is Transformational leadership and the other is Transactional leadership (Bass, 2010). Transformational leadership proposes that a leader must motivate his/her team members towards achieving organisational objectives by providing support in the form of psychological impetus. Transformational leaders use to have high level of emotional intelligence and a critical conflict resolution skill with the help of which they handle their organisational responsibilities with positive outcomes (Rush, 2011). Transactional leadership, on the other hand, propagates that a leader can motivate his/her team members by offering financial or other rewards upon achieving a specific level of performance. The said theory highlights that a leader must build up a give and take relationship or a transaction oriented relationship with his/her team members. Unlike transformational leadership in which a leader projects himself/herself as the role model before the team members in order to motivate them to a great extent, transactional leadership tries to build a monetary relationship between a leader and his/her team members (Bel, 2010). In my attempt to analyse the particular leadership style that Mr. Ralph uses to follow, I found that he has chosen democratic and transformational leadership style as his preferred ones. He prefers to include his colleagues in the institutional decision making process. He does not like to impose his taken decisions on others; rather he prefers to take collective decision by making effective consultation with his colleagues and subordinates. He even prefers to include students and their parents in the institutional decision making process. In order to motivate his subordinates towards achieving institutional objectives, he does not rely only on offering monetary rewards; instead he prefers to place himself as the role model for his subordinates. He believes that by following him as the role model, his subordinates will able to motivate themselves to a great extent which will help them to achieve institutional objectives. It is quite easily understandable that Mr. Ralph Luchow has earned success in the leadership position of the institution only with the help of his leadership, management, professional and personal skills. These skills help any individual to perform his institutional responsibility with ease (www.uknow.gse.harvard.edu, 2014). As far as his leadership skills are concerned, he possesses a particular leadership skill which needs to be mentioned here. The skill is his effective communication skill. As Mr. Ralph is a great orator, he bears an effective communication skill with the help of which he is able to build up productive communication within everyone directly or indirectly related to the institution. With this communication skill, he is able to provide a clear cut idea to his subordinates about what the institution demands from them and how they have to achieve it. With his effective communication skill, Mr. Ralph becomes successful to motivate his subordinates in such a way that they can easily achieve their institutional objectives. One notable management skill that Mr. Ralph possesses is his goal-orientation. As the Principal of Hill Advent College, he designs specific goals for each and every employee of the institution. He is a devout believer of goal-orientation approach in which he prefers to evaluate the performance of his employees against their individual predefined objectives. He uses to conduct an annual performance evaluation process for his employees in which the success of each and every individual employee in fulfilling his/her goal is measured. The most important professional skill that an individual possesses is his problem solving skill (Kotterman, 2009). With the help of this skill, Mr. Ralph can deliver speedy resolution to the grievances of the students as well as of their parents. The said skill helps him to handle adverse organizational situations with success. His emotional intelligence can be treated as the most significant personal skill that Mr. Ralph possesses. The said skill renders him an ability to give value to the emotions of others. It helps him to handle his workforce more efficiently. As the principal of Hills Adventist College, Mr. Ralph stays at the top level of administrative hierarchy of the institution. As the college is a privately owned Business Organisation, a trustee board uses to sit at the top most level of the hierarchical ladder (Lunenburg, 2011). In the very next level of the hierarchical ladder, Mr. Ralph uses to find his place as the Principal of the college. 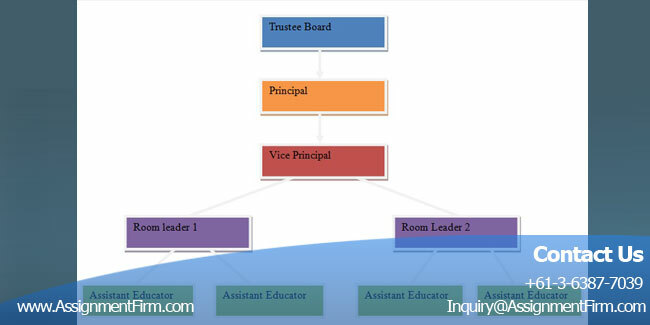 In the lower part of the hierarchy, we find the places for Vice Principal, Room Leaders and Assistant Educators. As the Principal of Hills Advent College, Mr. Ralph has certain responsibilities to perform. Besides managing the entire administration of the institution, Mr. Ralph has to involve himself in various other activities like formulating syllabus for the students, handling grievances, recruiting staffs and conducting strict monitoring on the student admission process. In the college, Mr. Ralph has implemented a successful organisational culture in which every employee reports to his/her immediate superior. The advantage of this system lies in the fact that Mr. Ralph does not have gather inputs from various sources of the Business Organisation; the Vice Principal uses to provide a detailed report on the operational process of the organisation. Mr. Ralph is that kind of a leader who believes that a leader is as good as his team is. By following this belief, he prefers to maintain effective collaboration with his team members. As the principal of the college, he often has to face certain challenging situations. With the help of his acquired leadership skills like communication skill, effective listening skills, and problem handling skills, he is able to get out of those challenging situations. His leadership skills undoubtedly help him to achieve his own organizational objective of transforming his college into a centre of excellence. Whether it is a business organisation or a learning institution, the significance of leadership cannot be ignored. With the help of his/her leadership skills, a leader can only guide his/her team members in a successful way. It is under the proper guidance of a competent leader that his/her team members can achieve their individual organizational objective. Get BUS700 Organisation and Safety Management (INDG 417) Assignment Help By Professionals.